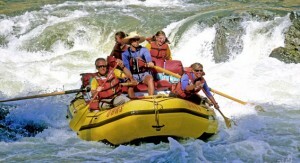 Bring your corporate team together on a whitewater rafting adventure in Banff or Jasper. BANFF, JASPER, Alberta – Through the years I’ve spent living as a mountain man in the Canadian Rockies, I’ve met lots of guys attending corporate meetings. Banff National Park, Jasper and the surrounding areas are great places to hold company outings and planning sessions. Not only do the mountains provide great recreational team building opportunities, but there are a plethora of first rate accommodations and locations for corporate meetings. Some of the business guys I’ve met have used their corporate meetings as a great excuse to get in touch with Mother Nature. Canadian Rockies wilderness team building activities are a great way to get your team to work together. Imagine taking your team on a whitewater rafting adventure, that is a great way to build trust and promote creative thinking in “life compromising” situations. Or enjoy a pleasant cruise on Lake Louise to make new business contacts or improve company relations. Banff and Jasper are home to some of the best accommodations in the Canadian Rockies. Whether you are looking for a small lodge to hold an intimate coporate event, or have a managers from all over the country coming together for a large gathering, there are accommodations to meet your needs. The next time you are planning a corporate meeting, consider joining me in the Canadian Rockies for team building activities and great meeting places. For more information on activites: Click here! Long long gone are the days when Calgary was considered a boring city. Before heading up to the delights of Banff, Canmore and Jasper, why not stay a few days in Calgary. The list of things to do is practically endless. If you have time to stop for a few days before hitting the mountains, here are just a few of the things to keep you occupied. 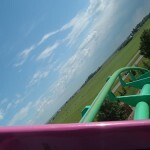 The sights and adrenalin from a Calgary rollercoaster. Calaway Park: There is no end to the fun at Calway Park. It has everything you would expect from Western Canada’s largest amusement park including a roller coaster, train ride, log ride, Ferris wheel, and all the other classics you have come to expect. It is set in a wonderful location also. On a clear day, you can get a great view of the surrounding mountainside from the top of the Ferris wheel. Refreshingly, entrance is with a “one price, all rides” ticket so you don’t have to spend half an hour outside pondering your options. There are rides for all ages, even the oldies! In the summer, there are some great live shows too. It is always a great day out with the family. On Hwy 1 (Trans-Canada Hwy, aka 16 Ave N. in Calgary) about 10 minutes west of Calgary; use exit 169. 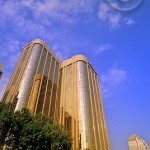 The distinctive sight of the Calgary Towers. Calgary Tower: Built in 1968, this Calgary landmark had its greatest moment of glory when it acted as a torch for the Olympic flame for the winter Olympics in 1988. The 3D view that you get from the look-out deck is something else but with the new glass floors built in, it offers a whole new view. It is nothing short of terrifying and the kind of experience that every human should at least attempt once. If you are feeling a little shaky on your feet after looking down to your doom, there are two great restaurants in the tower to get your heart beating at normal pace again. Canada Olympic Park: This is one of the most visible reminders in Calgary of the successful 1988 Olympics. Today, athletes still continue to be trained here to try and maintain Canada’s great record in the winter sports. There are three ski jumps here as well as a bobsleigh and luge track. Among the many things you can do, during summer you can use the skyline which lets you experience flying off the 90-metre tower like the ski-jumpers. Freakin awesome! Calgary Zoo: This is one of North America’s largest zoos and not so coincidentally has many animals from around the world. It is very popular with kids and there is also a large conservatory and garden area for the parents to relax. Speaking of parents, there is also the Prehistoric Park, featuring life-sized sculptures of dinosaurs, and many animal and nature-themed playgrounds dotted around the zoo. Calgary Chinese Cultural Centre: This is a fairly self descriptive museum. Everything you need to know about the history and culture of Chinese Albertans. There are some small businesses here too. Keep an eye on the local media to see what sort of events are coming up that might suit you or your family. Also ask the staff at your hotel who are usually happy to help.